The biggest city in all of Idaho, Boise is also the state capital. Located in Ada County on the Boise River, Boise is situated in the southwestern part of the state and covers an area of 82.80 square miles. 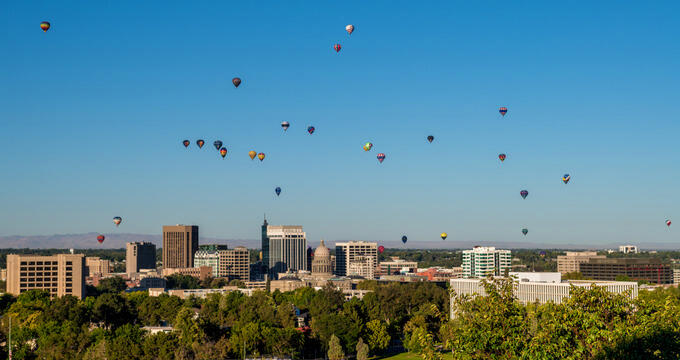 The city of Boise has a population of over 220,000 people, with hundreds of thousands more living in the surrounding Boise-Nampa metropolitan area, and is the cultural and commercial center of the Gem State. There's a lot of history behind the city of Boise, with various stories regarding the origin of the city's name, with most of them linked to the French word for 'wood', which is 'bois'. The most popular story goes that an exploration party had been traveling through dry, arid terrain for a long time when it came upon the Boise River Valley. The sight of all of the trees overwhelmed one of the French-speaking party members, who triumphantly cried out "Les bois! ", leading to the name of Boise. That classic story may never be confirmed, but the city of Boise was founded in 1863 and incorporated a year later in 1864. The city of Boise, Idaho grew and grew over the years, with new businesses and residents flocking to the city through the 20th century. Museums, galleries, hotels, theaters, and even a zoo were constructed over the years, adding more attractions and appeal to the city. Boise State University was also built just south of Downtown Boise and is one of the top educational institutions in all of Idaho. The elevation of a city is the term given to how high it is above mean sea level. In the case of Boise, Idaho, the city has an elevation of 2,730 ft (830 m), which is relatively high for an American city. Many major cities around the United States are located in coastal areas and have very low elevations. New York City, for example, has an elevation of only 33 feet (10 m), while Los Angeles has an elevation of 285 feet (87 m) and Chicago has an elevation of 594 feet (181 m). This means that most United States citizens live at relatively low elevations, but residents of Boise, Idaho, are much higher up than the average. In terms of mean elevation, Idaho is one of the highest states in the United States, trailing only Colorado, Wyoming, Utah, New Mexico, and Nevada in this geographical statistic. The state of Idaho has a mean elevation of 5,000 feet (1520 m), so the city of Boise is well below the state's mean reading. The highest point in all of Idaho is Borah Peak, a mountain in the Lost River Range, which has an elevation of 12,668 feet (3,861 m), while the lowest point in the state is the confluence point of the Clearwater River and Snake River, which has an elevation of 713 feet (217 m). The highest city in the state of Idaho is Island Park, located in Fremont County, which has an elevation of 6,290 feet (1,917 m). As well as Boise, other major cities in Idaho include Twin Falls, which has an elevation of 3743 feet (1141 m), and Coeur d'Alene, which has an elevation of 2188 feet (667 m), so the city of Boise, Idaho isn’t the highest or the lowest major city in the state when speaking about elevation. The city of Boise has a semi-arid continental climate, meaning it has four unique seasons that can be distinguished as different from each other, but tends to have lower than normal amounts of rainfall due to its desert location. Boise has very hot and dry summers, with temperatures often getting close to 100°F (38°C), while the winters in Boise are quite cold, with average temperatures of around 301°F (-1°C) in December. Due to the desert location of Boise, rainfall is rare and the temperature can swiftly drop after the sun sets, making the average night much cooler than the typical day. There are plenty of things to do in Boise, with the Boise State University being a big part of the city and the student population helping bars, clubs, and restaurants to thrive. The city is also a big cultural hub, with many live music shows and festivals, along with theater groups and stage shows. Various museums and galleries can be found around Boise too, and the Boise Centre on the Grove is one of the largest convention centers in Idaho, hosting many different events throughout the year. Recreational activities in and around Boise include hiking, cycling, camping, and kayaking.